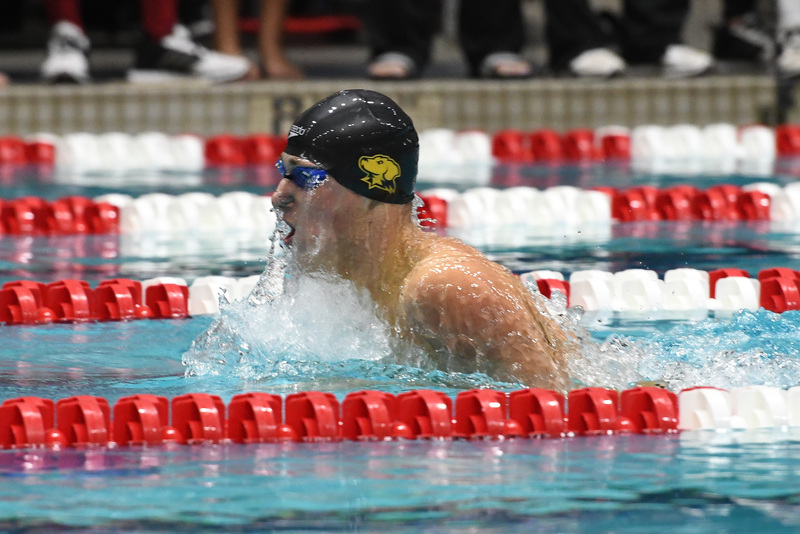 The UMBC men’s Swimming and Diving team has earned its third Coastal Collegiate Sports Association (CCSA) championship in a row, just one week after the UMBC women’s team captured another America East championship. UMBC finished with 1522 points, more than 300 points ahead of the rest of the field. UMBC’s Ilia Rattsev ’20, bioinformatics and computational biology; Jared Vance ’18, business technology administration; Connor Ganley ’19, chemical engineering; and Gregor Spoerlein ’17, environmental science, won gold in the 400 freestyle relay, with a time of 2:58.21. Rattsev and Spoerlein also finished in first and second place in the 100 freestyle, with Rattsev earning a NCAA B cut. Spoerlein picked up another gold in the 200 freestyle, with a time of 1:37.32. The Retrievers swept the 200 backstroke field, with Alexander Gliese ’19, mechanical engineering, winning gold (1:44.59); Ahmed Wahby ’19, engineering, earning silver (1:46.06); and Garrett Wlochowski ’20 earning bronze (1:47.40). Both Gliese and Wahby had times strong enough to earn NCAA B cuts. Wahby also earned silver in the 200 fly (1:48.61) and Philip Adejumo ’18, biochemistry and molecular biology, won silver in the 100 fly (0:48.53). Kyle Paxton ’18, financial economics, and Connor Ganley earned silver and bronze, respectively, in the 200 breaststroke. On day three of the championship, Nikola Trajkovic ’18, economics, set a new school record while winning silver in the 400 IM, earning an NCAA B cut with a time of 3:53.68. Swimmer Nikola Trajkovic. Photo courtesy of the CCSA. At the conclusion of the meet Cradock was named CCSA coach of the year, matching his team’s coaching staff of the year honor earned at the America East Championship earlier in the month. Photos courtesy of the CCSA.